Joshua Waitzkin (born December 4, 1976) is an American chess player, martial arts competitor, and author. As a child, he was recognized as a prodigy, and won the U.S. Junior Chess championship in 1993 and 1994. He is the only person to have won the National Primary, Elementary, Junior High School, High School, U.S. Cadet, and U.S. Junior Closed chess championships in his career. The movie Searching for Bobby Fischer is based on his early life. 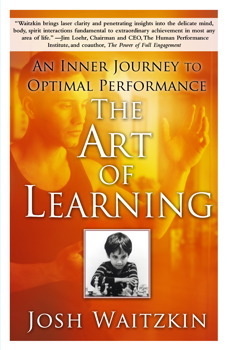 In his riveting new book, The Art of Learning, Waitzkin tells his remarkable story of personal achievement and shares the principles of learning and performance that have propelled him to the top–twice. This entry was posted in Mental Training and tagged champion on November 10, 2015 by MGrodski.